If you’re a college football fan–and you are, obviously, or you wouldn’t be reading this–the 2015 Rose Bowl has it all: great teams, great coaches, great players, clashing to determine who’s going to get a shot at all the marbles on January 12th. But what about the venue? What about the stadium? If ever there was ever a case of the stage outshining the actors, this is it. “The Granddaddy of Them All” kicked off the whole post-season bowl craze, way back in 1902. To put that in some perspective, that was the year before the Wright brothers took off from Kitty Hawk. 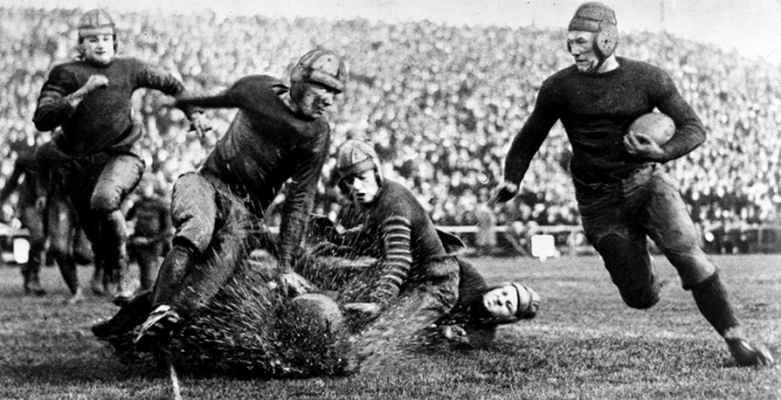 The 1902 tilt was called the “Tournament East-West Football Game,’ and pitted undefeated Michigan against Stanford. The whole idea behind the game was… money. The brains behind the Pasadena Rose Parade felt a ballgame might generate some extra revenue to help defray the cost of all those flowers. The score was 49-0 in Michigan’s favor in the third quarter when a deflated Cardinal squad walked off the field and refused to return. The debacle was so complete, the Tournament of Roses bigwigs quickly decided football wasn’t the ticket after all. For the next 13 years they ran chariot races, ostrich races (seriously, I’m not kidding), anything other than a football game to raise extra parade dough. 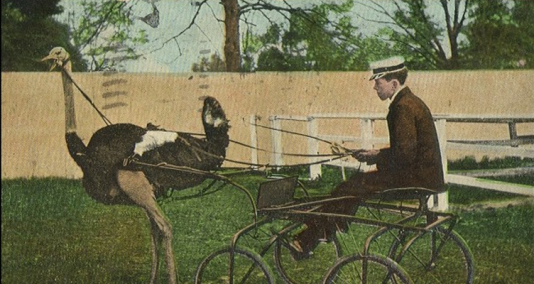 Ah, there’s nothing like the excitement of a good ostrich race. Finally, in 1916, undoubtedly due to an outbreak of dreaded ostrich disease in the SoCal area, the powers-that-be relented, and football was back, this time to stay. Between that year and 1923, the year after the Rose Bowl stadium was built, games were played in Pasadena’s Tournament Park, three miles from the current facility, near the Cal Tech campus. Seating was limited, so it was decided to build a larger facility to handle the growing holiday crowds. The Rose Bowl stadium was based on New Haven’s Yale Bowl’s design on steroids. When it was launched, it was the largest football stadium in America and retained that distinction until it was passed in 1998 by Michigan Stadium. Rose Bowl seating reached its max during the period 1972-1997, at 104,594. Today’s capacity of 92,542 places it at No. 7 among U.S. football parks, but it remains the largest post-season bowl game stadium. The Rose Bowl, somehow larger than life. From the vantage point of your couch, whether you’ve tuned in from Tallahassee or Eugene, there’s always something brightly scrubbed and slightly unreal about the Rose Bowl parade and subsequent games. Southern California, the home of Hollywood, always seems so, well… modern. But as you watch the Ducks take on the Seminoles on New Year’s Day, remember you’re participating in a cultural and sports tradition that dates back 113 years. So enjoy. And keep your eyes peeled for the chariots and ostriches.